To purchase one or both books at £11.00 special offer price, please click the Add to Cart button below. 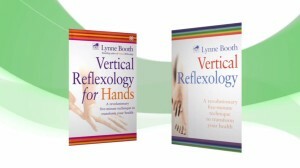 Click for more details about Vertical Reflexology and Vertical Reflexology for Hands : Self-help chapters in both books and full instructions ranging from relaxation techniques to advanced VRT for hands and feet. Vertical Reflexology was an immediate best seller and was one of the Daily Telegraph’s 20 complementary books of the year. Makes an ideal Christmas present for colleagues, family and friends! “As a reflexologist I found this book very informative, and good reference book with excellent diagrams”. “I saw lots of good press about it and bought the book to try it myself. I can report that it is easy to learn and seems to relieve symptoms effectively. I can see that it will become part of standard reflexology training and practice and would like to recommend it to reflexologists ready for alternative approaches”. “Very impressed with this book. Have been working with reflexology for 25 years and find this a wonderful extension to my reflexology skills. It works very well”. “One of the joys of this book is that is so easy to follow with step-by-step instructions for helping common ailments. The information is clearly conveyed to the reader. But best of all, VRT works. Using this book, it really is possible to produce significant results in just five minutes. The section on self-help techniques deserves special mention. Highly recommended”. “Book arrived quickly. contents as expected , good book , detailed and informative. good diagrams and methodology enabling me to put it into practice. Highly recommended for those who practice reflexology”. “A wonderful therapy – it is possible to do on yourself but even better by therapist. Clearly presented and so easy to read”.